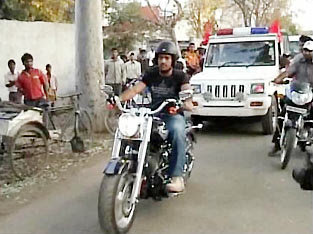 Love of old motorbikes led Indian captain MS Dhoni to the city police headquarters at Lalbazar. Some police officers had told the Dhoni that the city police has an old model of motorbike - Yamaha 350 - kept in the headquarters premises. So, he went to Lalbazar at night and he said Dhoni also rode the bike. As visit to Lalbazar became public,a large crowd from local public to electronic media personnel and photographers gathered to get glimpse on indian captain. Speculation was also rife as nobody was sure why the cricketing icon had suddenly gone inside the police headquarters. Dhoni added to the suspense by refusing to answer any of the queries from the scribes while leaving Lalbazar around 2145 hrs IST.